I have some old hole-y sneaker shoes that need to be thrown up there in retirement. But they are so comfortable I still wear them. Wow. Talking about retirement, have you ever seen the skateboard graveyard in London? There are some shoes down there as well, but mostly retired skateboards. It’s on one of those foot things of the Golden Jubilee Bridge nearest to the skatepark. Look over the railing onto the platform down there. I think you could take some great pictures. The skatepark is also amazing, by the way. i have a pair of those, dn’t really want to retire them. what a fantastic picture..Your talent is such a gift to the world. i am blessed that through my blog my path crossed with yours. Not only to I love the photo but I love the title. Great shot! Another great pairing of image and title, AB! Beautiful! 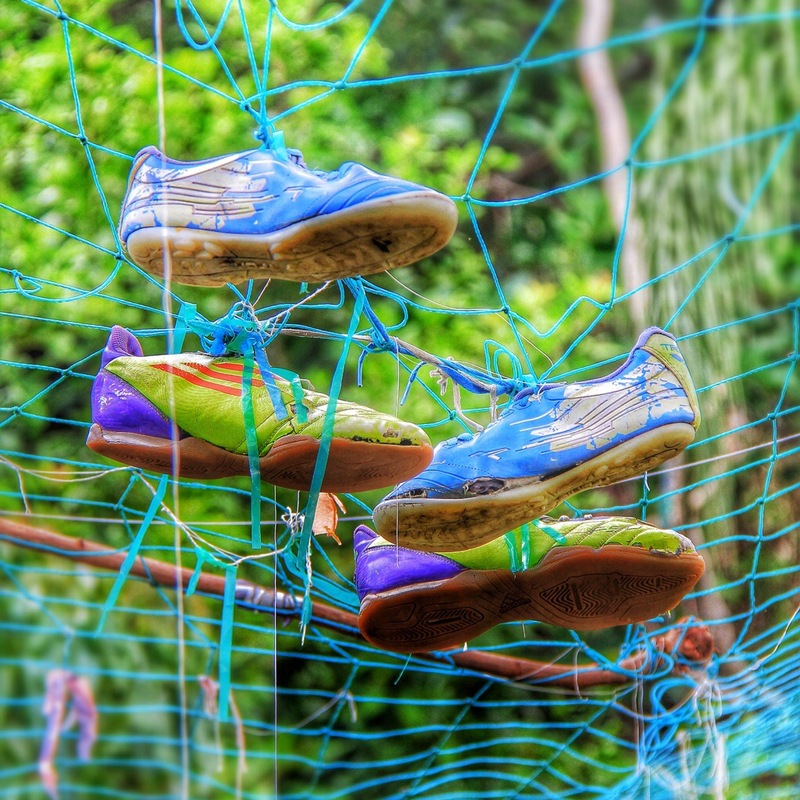 Reminds me of our shoe tree, where we keep an old pair from each of the children who have visited us here. Hahahahahaha. This one is funny. Are you in a humorous mood today AB? I guess that’s what makes your writing so diverse eh. I am about to retire from a 35 year career. this made me nervous that retirement is the end! I didn’t even get the shoe metaphor until I read the comments. Guess I had a bad day at work today. Very cool post and pic! Love this post. A metaphor for life? Absolutely; have a wonderful weekend! Beautiful words, I am sure they are treasured in your moor! My hope is that when I retire December 31 I will be able to do kind things for people because I will not have to work all the time. this is another vision completely.